Entrepreneurs David Fletcher and Brandon Hannon launched GEV Offshore as a start-up on the town’s Gapton Hall estate six years ago and have rapidly grown the business to become a world leader in wind turbine blade maintenance. They predict their 120-strong staff will increase to 250 within three years as round three of windfarm development off the British coast brings even greater opportunities. The company is in discussions with Yarmouth College about increasing its number of apprentices in the coming year and has pledged its commitment to fostering young talent by supporting the Norwich For Jobs campaign to drive down youth unemployment. 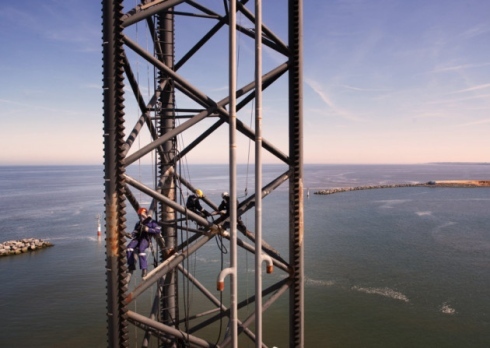 GEV Offshore’s technicians, who are also involved in the maintenance and inspection of oil and gas installations as well as working in other sectors, such as the power industry, are trained to a high level as rope access specialists. Managing-director Mr Fletcher said: “Training for each technician costs around £15,000 and we invested £750,000 on training this year alone.” In addition to its engineering services, the company has in the past two years become the UK agent to market Oxifree, a plastic-like resin used to coat equipment to slow down corrosion. Its application has grown rapidly in the oil and gas industry and the company is now conducting trials on windfarms. Oxifree won GEV an innovation award at the Eeegr (East of England Energy Group) awards in 2011 and Mr Fletcher predicts that in the future it can yield 25pc of the company’s income. However, it the wind energy sector which is fuelling the firm’s growth – from a turnover of £3.6m last year to £8m this year to a prediction of £14m for next year. Mr Fletcher said: “We worked on over 30 windfarms last year – both onshore and offshore – and 40 this year. Our technicians are in Thailand, Morocco and in all parts of Europe. Their current apprentices include 11 technical and nine office trainees; they have been working with the national training provider Raktrain as well as Yarmouth college.